In the last of the six Palliser novels, the sudden death of his wife, Lady Glencora, leaves Plantagenet Palliser, the Duke of Omnium, finding himself in charge of his three children. 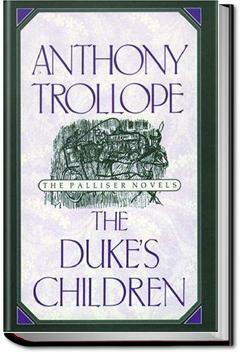 The eldest, Lord Silverbridge, has recently been expelled from Oxford; his younger brother, Gerald, is about to enter Cambridge; and the youngest, nineteen-year old Lady Mary, has imprudently formed an attachment to Francis Tregear, who, while certainly a gentleman, unfortunately has no income. Before her death, Glencora knew (and approved) of her daughter's attachment; the Duke, however, does not know of it, and is not at all likely to approve. Mrs. Finn (the former Marie Goesler), who was Glencora's closest friend, learns from Mary of her love for Tregear, and is faced with the question of either keeping silent, thus breaking faith with the Duke (who has entrusted Lady Mary to her care) or telling the Duke, and breaking faith with Mary herself. Last of the Palliser novels, not the strongest by far, but a good read. The female characters in this book are fairly predictable, but Trollope almost makes up for it with his male characters. That was a letdown; I'd hoped to go out with the Pallisers on a higher note. And so Trollope's Palliser series comes to a close. This is, again, a stand alone novel, and doesn't rely on previous works in the series. But you would be missing the joy of having read the others. Initially put off reading this novel after the first few pages because of the demise of a pivotal, well loved female character whose presence throughout the series had been an absolute delight. I couldn't believe when I first saw it mentioned in some reviews of the novel. After reading the six Barsetshire novels, I've now finished the six Palliser novels. With this, the last one, I'm really bereft in saying goodbye to his characters and thoughts in these two magnificent series. Loved this series of books and feel sad now it's come to an end. It was so sad when the Duchess died , the Duke being left with their three children. Even though I knew what had happened between the end of the last Palliser novel and that start of this next – and final – novel in said series, and yet the opening sentence of ‘The Duke’s Children’ was heart-breaking.